Justin Andrew Mason - Paths to Adventure: 5th Edition Mini-Dungeons Now Available! 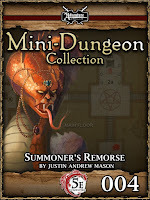 One of my Mini-Dungeon adventures that was published by Adventureaweek.com is now available for 5th Edition thanks to the awesome conversion team working away at AAW GAMES. The original Pathfinder version of Summoner's Remorse was rated 5-stars + seal of approval by Endzeitgeist. 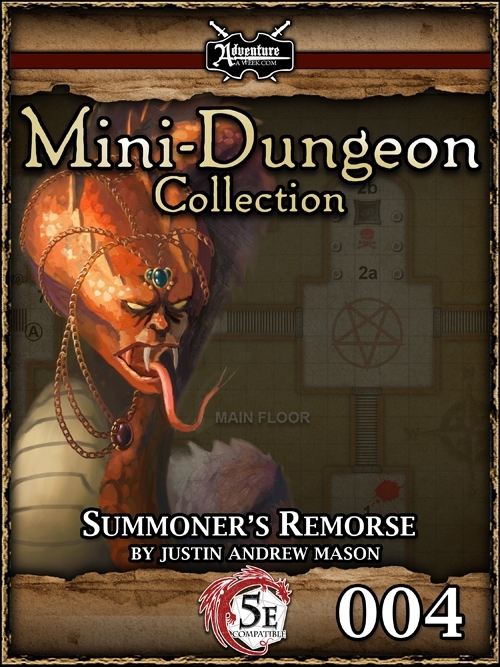 So, if you're looking to add a quick and fun 5E adventure for 4-6 PCs of Levels 5-6 to your game, go check it out along with the dozens of other Mini-Dungeon adventures that are available! This adventure is available for purchase via Adventureaweek.com, DriveThruRPG, and RPGNow.